“Just sit still,” I say to my cat every time she rolls around on the carpet making chirping noises and being cute. No matter how many pictures I take, it’s almost never comes out right. 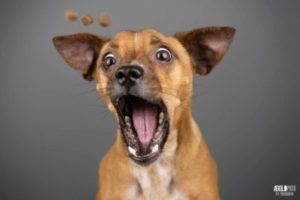 If this is a recurring (first-world) problem in your life when all you want is a good picture of your beloved four-legged friend, Adam Goldberg can help. At Resident Culture Brewing, Goldberg and his wife, Mary, will post up with a portable photo studio to bring your dogs into their studio and photograph them on April 16, 7-9 p.m. Adam is the lead photographer and storyteller for AGoldPhoto, a pet photography studio in Tampa, Florida. In the last 2 1/2 years, the couple have traveled the country, hosting pet photography events at breweries and donating money to the local animal shelter of whichever city they’re in. So far, they have raised over $100,000 in charity. During their two stops in Charlotte (the Goldbergs hosted the first event at Resident Culture on April 11), the Goldbergs are fundraising for the Humane Society of Charlotte. 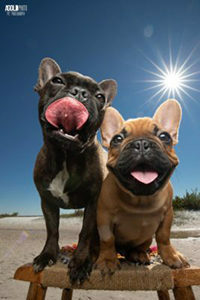 Pet owners must sign up for slots on the studio’s website. The April 11 event sold out quick, but there are still slots available for April 16. Queen City Nerve caught up with Goldberg to talk about the location of the photo shoots, getting dogs to sit still and photographing man’s best friend. Queen City Nerve: Why do the event at a brewery instead of at a park or other outdoor location? Goldberg: We started out by doing breweries because someone asked us to host an event at their favorite brewery, and my wife and I are big craft beer fans. We used to spend all of our weekends at breweries. So when we first started we were able to have a craft beer, take photos of pets and raise money. It’s kind of our favorite things compacted into one. We were able to find empty spaces in these breweries and set up our studio. Beer people with dogs, is our target audience usually so it’s a perfect fit for us. What has been your favorite experience with photographing pets across the country? Our favorite kind of experience is when a dog owner comes and they’re kind of nervous, which in turn makes their dog a little nervous. Mary and I, we’re able to have a calm demeanor and turn a dog that was really scared and may not want their photo taken and by the end, they won’t get off the platform because they love all the treats we gave them and their photo shoot had gone so well for the second half. But the first half, it’s awful, so it’s a fun moment to be able to turn that around. Then when the owner says, “You know, I never thought Fluffy would sit still for a photo shoot. I don’t know what you guys are doing, but I could never get a photo of my dog.” Just being able to make the owner happy in a situation where they can’t get a photo of their dog, they come to us, they’re raising money for charity, they’re having beer, it’s just a win for everyone. 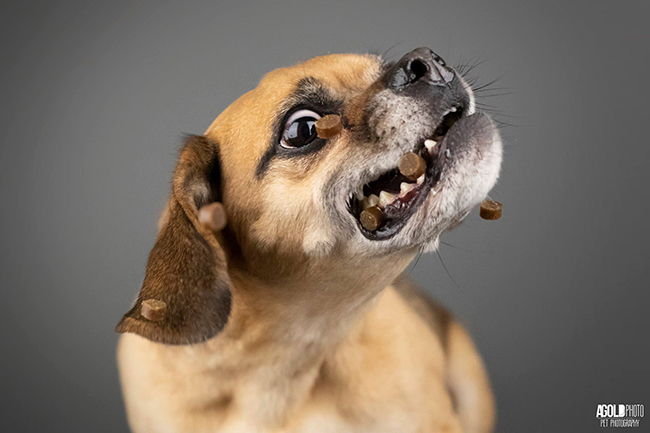 Do you always throw treats to the dogs or are there other ways to capture the dog’s personality? We like to throw the treats to them, not at them, so they’re participating in it. But we have an extremely fast camera to capture the moment there. Sometimes what happens too is they’re like, “Oh my god, I didn’t know my dog could even catch treats,” because it’s not second nature to throw treats to their dog. But it’s funny to see the reactions when we show them the back of the camera and the dog’s eyes are bulging out of their head and they’re chasing after the treat and the owners have a great reaction to that. We don’t do treat-catching with every dog, especially the more shy ones or the younger ones aren’t a good candidate for it. We use a very high-quality treat, we have a partnership with Zuke’s [Dog Treats], they give us treats. Sometimes dogs, when they’re nervous or in a new situation, they won’t eat at all. It’s interesting to see when dogs do make that turnaround they start eating everything. We also use peanut butter. We use Justin’s Peanut Butter, which is super high-quality too. So between the treats and the peanut butter we’re really able to get out their expression. But there are times where they don’t like the treats that we have and we encourage owners to bring their own as well, just in case. Has there ever been a time where the dog just can’t sit still or is too nervous to be motivated by food? 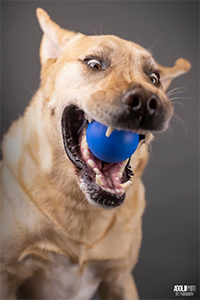 Sometimes dogs don’t take well to the photo studio. It’s kind of a tight area and we don’t want to force the dog to have their photo taken. There’s been times where we have to put an end to the photo shoots but lately what we’ve been able to do, since the event is hosted in the evening, we’ve been able to say, “Hey let’s take the dog outside, take a quick photo that way,” so the owner is able to have something but it’s not on our signature grey backdrop. Because most dogs have that experience before and some get uncomfortable with it, and we never want to force them to do it. As far as aggressive, we’ve never had an aggressive dog. Families that have dogs that may not get along with other dogs, we’re able to do private photo shoots with them, where we set up at a local park or go to their home. The one thing we like to drive home to the owner is that as much as they want these photos of their dog, we never want to force them to do it and they understand that. The Pet Photo Shoot Fundraiser for the Humane Society of Charlotte is on April 11 & 16, 7-9 p.m. at Resident Culture Brewing, 2101 Central Ave. Sitting fee $50, required photo package purchases start at $60.